A key venue in the history of Chinook Jargon, the fur trade and the Pacific Northwest now has “an app for that”: Fort Vancouver Mobile. It looks promising! The Fort Vancouver Mobile app is designed to be used on site in The Village area of the Fort Vancouver National Historic Site, in Vancouver, Wash., just north of Portland, Ore. This urban National Park Service site was the hub, in the mid-1800s, of the Hudson’s Bay Company’s fur trading empire and the early end of the Oregon Trail. This place later became the first U.S. Army Post in the Pacific Northwest. 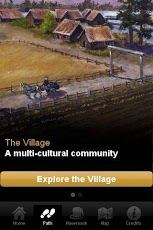 The app delivers an array of media — text, audio, video and animation — about the site’s Village. To begin, download the app and walk to the sign at the entry of the Village. If you download it & give it a go, let me know.